The High Mast with Mobile crown Raising and Lowering gear is designed for the raising and lowering of the luminaries of flood lights mounted brackets to the ground level for maintenance by means of mechanical winch and wire rope arrangement. Bottom shaft is provided with base plate and door opening and middle and top shafts as per the height of the Mast required. High Mast supplied with Luminaire ring , Head Frame, Centralizing Arm, Stainless Steel Wire Rope, Electrical Cable, Disconnectors, Junction and Distribution Box, Mechanical Winch, Power Tool, Latching (Optional), Pulleys and Top Conapy. Octagonal sides tapered steel pole Manufactured by press shaping of steel plates and welding them longitudinally. Manufacturing process includes : Cutting to Length,Trapezium Cutting,Longitudinal Folding,Longitudinal Welding,Welded Base Plate,Brackets to carry luminaries / Flood Lights,All steel parts are hot dip galvanized. Continuous welding ensures uniform deposition at all points and deep penetration welding. staggered cage ladder with rest platform. Paruthi Engineers have been manufacturing high endurance steel poles to the entire satisfaction of the customer production range covers both Galvanised & Painted poles manufactured in accordance with IS:2713 or any other International Specification required by the customer. Poles are vigorously tested, Physically, Chemically & Metallurgically . We design and manufacture swaged poles and specialty steel structures. 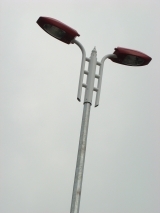 These include all standard types of highway and street lighting poles as well asthe standard types of traffic signal poles. Swaged poles are made of seamless or welded tubes of suitable lengths swaged and joined together. 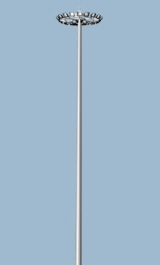 We manufacture all kinds of poles as a measure towards vertical diversification with latest technologies. The poles unit is well equipped with fully computerized plants & machineries like CNC Press Brake, Sub Merged Arc and Welding Machine with facilities to produce poles up to the length of 12meter & thickness up to 8 mm with a customised look. PEPL is in the process of developing Electrical Transmission Poles. These Poles can be a replacement to the bulky Transmission Towers. They would also help in substantially reducing the Civil & Structure cost thus incurred as per the present practice of using Lattice structure.